St. Luke’s Scout Group wins the lottery! The Group is jumping for joy as we have recently heard that The Big Lottery Fund has granted us almost £10,000 to renovate our headquarters. The HQ that opened in 1961, is in need of a new roof, windows and wooden cladding on the outside walls. This grant from The Big Lottery Fund will enable us to transform the building back to it’s former glory and ensures the future of a community hub for Scouting in our local area. For over 60 years, our successful Scout Group has actively engaged and supported young people from our area in their personal development, empowering them to make a positive contribution to society. Our young people enjoy what they do and have fun, taking part in activities indoors and outdoors. They learn by doing & take responsibility in new and challenging activities. Our fundraising team have been working hard over the last two years to help raise extra funds for the Group to provide it’s young people and volunteers the resources and means to participate in Scouting activities, camps and weekly meetings. This grant is a huge boost to us. Since June 2004 The Big Lottery Fund has awarded over £8 billion to projects that make a difference to people and communities in need, from early years intervention to commemorative travel funding for World War Two veterans. >> Read "St. Luke’s Scout Group wins the lottery!" Become a Group Exec parent rep! Would you like to get involved with the decisions that make your child’s Scout Group run? Do you have skills from work that you could bring to our Group? Then becoming a Group Exec Parent Rep maybe the role for you! We currently have parent rep vacancies for Tuesday Beavers, Thursday Cubs and Friday Scouts. If you’re interest and can help, why not apply for the post? It looks great on the CV too! >> Read "Become a Group Exec parent rep!" Hey, you don’t have to rely on being at a Beaver, Cub or Scout meeting to be able to gain Activity Badges, you can gain them at home as well! All you have to do is simply hover your mouse over your Section above (Beavers, Cubs or Scouts) and click “Activity Badges” which will take you the UK Scouting website with all the badges on. Choose the badges you want to do and when you’re finished just bring in what you have done to your meeting and talk about it. Simple huh? You can do the Staged Activity Badges too, so what are you waiting for, get choosing and fill your left arm full of badges. 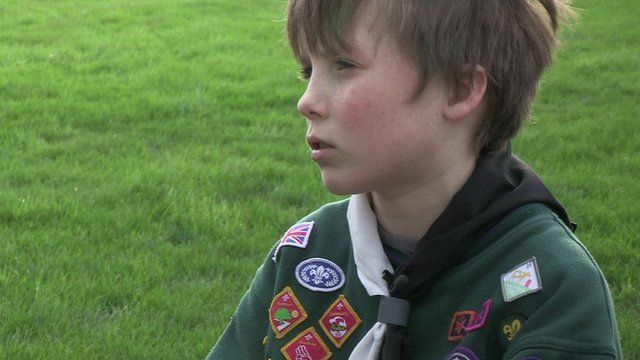 Click below to meet Harry, a cub from Bolton, who has gained all 41 cub badges, who’s up for beating his record? >> Read "Get earning Badges!" Fresh looking and easy to navigate your way round, you’ll be able to keep up to date with all the news within your Group and unit, and discover new ways you can get involved to help your Group grow as we move into a new decade of Scouting. The site is still in it’s infancy and great plans are afoot, so come back over the coming weeks as we bring more on-line. Don’t forget we are now on Facebook and Twitter as well, accessed from the home page, so give them a visit too. If you’re only discovering St Luke’s Maidstone Scouts for the first time, have a browse around and see how you can get involved. >> Read "Like our new website?" Then maybe you could be helping us raise funds while you shop. Easy Fundraising is just that! Sign up for an account today and you'll be raising much needed funds for your Group, without costing you a penny extra! What could be simpler? Click the logo below to find out more. © Copyright 2019, St Luke's (Maidstone) Scout Group, All Rights Reserved.